:: Working towards the Blackblot Product Management certification :: - Dreams are what you wake up from. in a traditionally system-integration-centric company is certainly not an easy feat. course on NICF - Strategic Product Manager. • There are three delivery strategies: technology, sales and market. Technology-driven delivery strategy creates products that often hinges on their success on awaiting a triggering event, while sales-driven focuses on quick wins and low hanging fruits, especially in a rapidly changing environment. Market-driven delivery strategy is deemed as the most sustainable and long-term, but requires highly procedural commitment and discipline. • Due to the myriad of interpretations and diversity that surround product management job titles, it is very difficult to ascertain what roles and responsibilities that are associated with a specific product management job role. • In Blackblot's product management team model, there are four distinct roles: Product Planner, Product Marketer, Marcom Manager and Sales Engineer. The former two are strategic while the latter two are tactical. which is definitely a good supplement to my PMP and Scrum. Blackblot principles to further enhance the current PM processes. After attending this course, how has it been working for you? 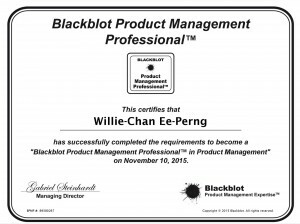 I am considering to learn more about Product Management but have some concerns about Blackblot Product Management. Can you share some insights? Would you recommend this course? It's quite a robust methodology actually and is ideal for IT-related product management. It's also endorsed by NUS ISS based on their evaluation of various methodologies in the market.